What goes into the world’s number #1-selling candy-filled lollipop? Start with a chewy, Tootsie Roll center; cover it with a delicious, hard candy coating; and you’ve got a simple, delicious treat, a Tootsie original that was the first lollipop providing an embedded candy “prize.” Tootsie Pops are known and loved by adults and kids around the world, and they're available today in more flavors than ever before. Tootsie Pops now come in a bunch with many specialty flavors! 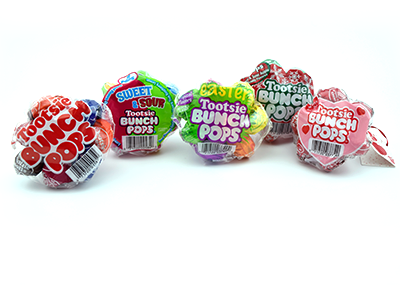 These Tootsie Bunch Pops are a little smaller than the original but just as good. 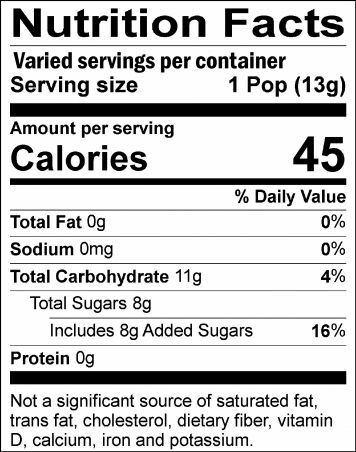 Ingredients: Sugar, Corn Syrup, Palm Oil, Citric Acid, Condensed Skim Milk, Cocoa, Whey, Artificial and Natural Flavors, Soy Lecithin, Artificial Colors (Including FD&C Red 40, Blue 1). Ingredients: Sugar, Corn Syrup, Palm Oil, Citric Acid, Condensed Skim Milk, Cocoa, Whey, Artificial and Natural Flavors, Soy Lecithin, Artificial Colors (Including FD&C Yellow 5, Red 40).